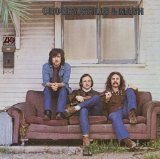 An instant classic upon its release 40 years ago, super trio Crosby, Stills & Nash’s self-titled debut LP featured their trademark close, rich harmonies and each member’s unique songwriting talents in nearly equal doses. Timely social and political statements mark each track, and the whole is one melodic celebration of late-60s folk-rock. Crosby, Stills & Nash spawned two singles, the somewhat bubblegum-ish “Marrakesh Express” (backed with “Helplessly Hoping”) and the perennial “Suite: Judy Blues Eyes” (b/w “Long Time Gone,” David Crosby’s lament to the Robert Kennedy assassination a year earlier), but neither made it into the Top 20 (the album itself hit #6 in the U.S.). Add the sweet ballad of “Guinnevere,” the mystic “Wooden Ships” (co-written by Crosby, Stephen Stills and Paul Kantner of the Jefferson Airplane), Stills’ warbling electric guitar in “Pre-Road Downs” and the toe-tapper “You Don’t Have To Cry,” and it’s not surprising that Crosby, Stills & Nash is one of the top debut albums of all time (it’s #4 on my Top 25 Debut Album list) and a quintessential example of the flourishing light country-folk-rock of the time (along with the Byrds’ Sweetheart Of The Rodeo and The Grateful Dead’s Workingman’s Dead, among others). A recommended buy, the CD or mp3 downloads are on Amazon. The entire album or individual tracks can be downloaded from iTunes, and a CSN (& Young) playlist is in the Playlist Vault.